Cuban reality immediately expands our perception and casts doubt on a lot of existing stereotypes. It turns out that the reality of the Freedom Island is multidimentional and includes not only the ideals of revolution and socialism. Tolerant Cuba, despite the main socialist direction of the recent decades, very convincingly preserved not only traditions of the island religious minorities (Hebrews, for instance), but allowed to exist and be active to various religious and spiritual groups. In recent decades the Cubans search for spiritual support not only in traditional for the island catholicism or Santeria (mixture of African beliefs and Christianity) but in other religious trends. On the island one can meet Krishna worshippers, Baptists, faithful to Sai Baba, Muslims, Shintoists, Buddhists... For Orthodox Cubans in Havana, Russian orthodox church and Embassy of Russia contributed to construction of a magnificent temple – the Kazan church that was consecrated with participation of Patriarch Cyrill (then the metropolitan of Smolensk and Kaliningrad Cyrill). But presently not only representatives of well-known confessions of faith «give guidance» to the Cuban population. When you travel about the Freedom Island by car, a very unexpected regularity rather quickly catches your eye as you visit small towns. Among half-ruined colonial structures, catholic and protestant temples, as a rule, usually there is a neatly repaired structure with masonic symbols. A great number of well-attended busts of Jose Marti in all imaginable and not places: in public gardens, shops, in front of residential buildings also draws your attention. 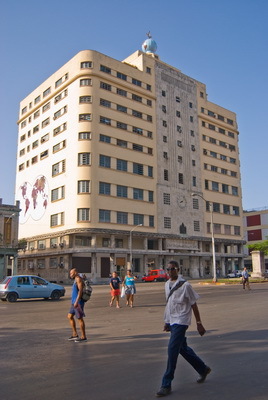 One of the highest buildings of Havana bears the sign of the globe and inscription «Grand Lodge». What does that all mean? The matter is that the history of masonic movement on Cuba is exceptionally interesting and intensive. Masonic lodges – is not a spirit of the present times, they have been existing since the end of the XVIII century. Even then they covered all Cuban provinces by its net. Representatives of elite – military, doctors, teachers, people of arts – became masons in the past times. 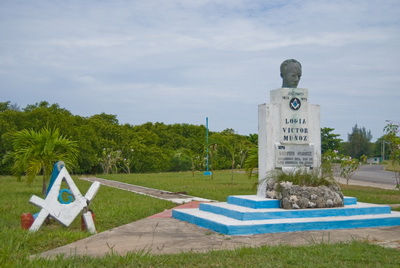 The role of masons is especially significant in the Cuban liberation movement: a lot of its participants belonged to masonic lodges, and a poet, philosopher, patriot of Cuba and banner of revolution Jose Marti became a member of «masoneria» even at the age of 18, having taken initiation in the Spanish lodge «Armonia». Before Cuba has become socialist, masons took active part in the government and other political structures. Today, according to the Great secretary Alberto William Rojas Aguilar, with whom I spoke to in Havana, there is not a single mason in the Cuban government. As one famous Cuban mason told me, a building of the main mason temple that impresses by its might, was built at the expense of «free masons» in 1955. After the revolution the property of masons was partially nationalised, the number of masons have considerably reduced. However, the mason temple was not closed. Simply today, apart of the holy of holies of masons, there are offices of several ministries. On top floors there is still an acting museum as well as several premises where masons get together for their secret meetings behind the closed doors. The museum curator proudly demonstrated to me a gallery of prominent masons of Cuba and America, among whom was the president of the USA George Washington, generals Maceo y Gomez, Simon Bolivar, Jose Marti, and also told me the story of creation of a Cuban flag. It is believed, that the state flag of Cuba is just a cousin of the main American symbol. But there is another version of its emergence. As everyone is well aware, the flag was first raised in the town Cardenas in 1850, when Venezuelan general and mason Narciso Lopez took an abortive attempt to liberate the island from colonizers. But the idea of flag, according to masons, occurred to the general even in 1848 - it dawned upon him in his dream. A friend of Lopez, an artist and poet Miguel Tolon, implemented the conception of the general into an artistic shape. One of the first names of that flag was «A lone star». 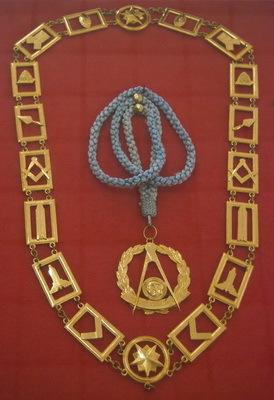 Three blue bands, according to masons, symbolize three years of masonic «apprenticeship». The total number of bands (five) symbolize five years of «friendship». The total number of symbols (seven) mean seven years of «mastership». A star and triangle have a special meaning. 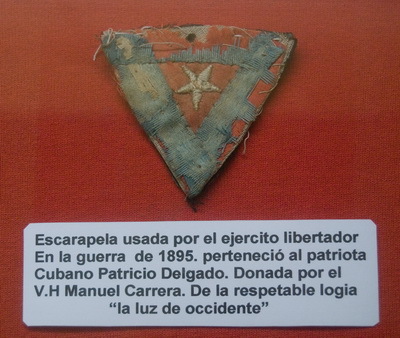 In 1902 Cuba became independent and flag of Lopez was accepted as a state one. 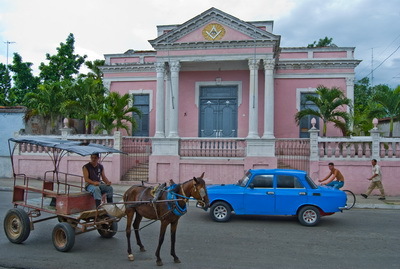 Presently in Cuba there are 28 500 masons and more than 300 lodges in various towns. Ethnic composition of the lodges is as heterogeneous as the population of the largest Antille island. 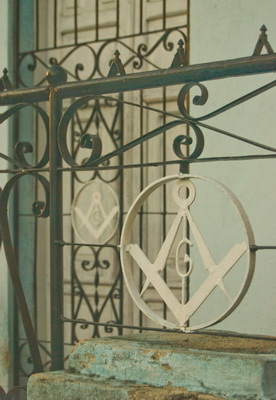 Most of «free masons» are in Havana there - 9 thousand people think themselves as masons in the capital of Cuba. It is not an underground movement, masons act openly and freely. Every person according to his will may admit that he is a mason. According to the Great secretary of Cuban masons, «free masons» even today actively take part in public work, humanitarian and charitable projects, freely think and work for the benefit of the motherland, not confronting the existing political system. 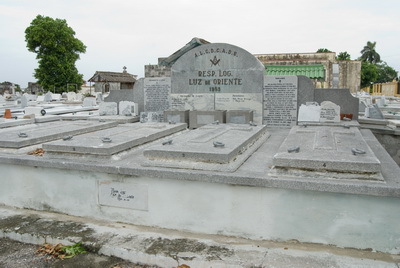 Burial place of members of various lodges in the historic cemetery Cementerio de Colon in Havana. 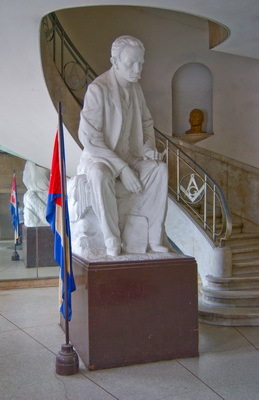 Monument to Jose Marti in the hall of the all-Cuban Grand lodge in Havana. 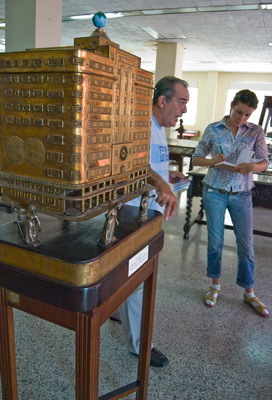 Museum exhibit of the Grand lodge in Havana. Elements of mansion of «Armonia» lodge. Province Santiago de Cuba, town Santiago de Cuba. Building of «Jatibonico» lodge. 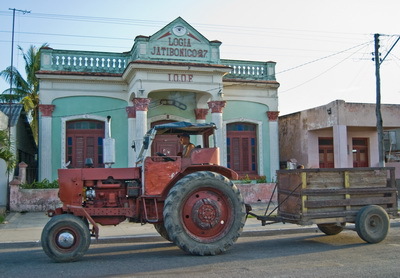 Province Sancti Spiritus, town of Jatibonico.